e-commerce services offered by SynapseIndia help businesses leverage third-party platforms like Magento to grow in the industry. The services help online retailers scale up their operation, and overcome the challenges associated with eCommerce platforms. The services include e-commerce web design, e-commerce website development, shopping cart development, m-commerce application development, and payment gateway integration, among others. While a staggering number of businesses across the world are thriving through digital commerce, many businesses are yet to tap the potential e-commerce. Small businesses have especially shown reluctance when it comes to full-fledged deployment of an online selling strategy. The businesses can heavily capitalize on the increasing tendency of consumers to purchase online. To achieve that businesses should strategically implement an e-commerce solution. E-commerce website developers at SynapseIndia understand the significance of such an e-commerce strategy. They, therefore, always keep some critical factors in minds that help consumers gain confidence in the online shopping process. The user experience on an online shopping platform is the most important factor. The developers help businesses provide a superior buying experience that enables customers to easily navigate the site. SynapseIndia ensures that it clients can always get the most suitable third-party eCommerce platform for their business. 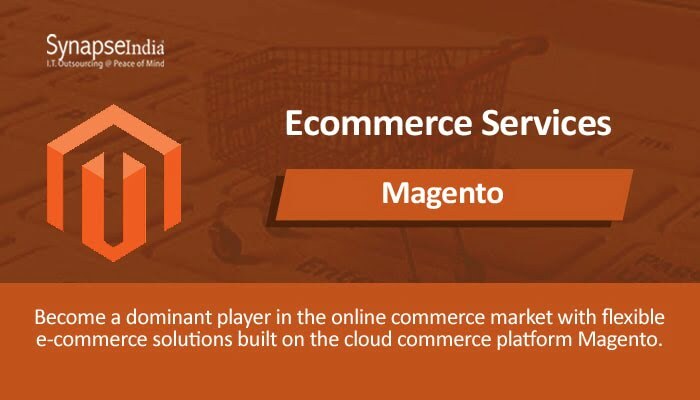 Platforms like Magento, for example, enable the company to build a wide variety of e-commerce solutions for clients operating in various industry verticals.